The relocation of La Prima Espresso’s roasting operation to 1500 Chateau Street in Manchester on the North Side has been welcomed with open arms and valued by community leaders for their investment. Since their relocation from the Pennsylvania Railroad Fruit Auction and Sales building in the Strip District in February, the production and wholesale unit of their roasting operation has been growing steadily, and now features business offices and an in-house cafe being planned in the front with the production area behind. The 4,000 square foot building also includes a 4,000 square foot lot. Colliers International | Pittsburgh is pleased to announce that it has been assigned as the exclusive listing agent for the sale of 102 Park Road in Cranberry Township. Patrick Tracy SIOR, Vice President of Industrial Brokerage and Anthony Pantoni, Industrial Services Specialist at Colliers International | Pittsburgh are representing the property. The property was owned by and is the former location of Thyssen Krupp Copper & Brass Sales. 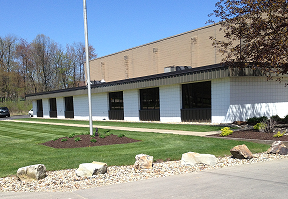 The 25,995 SF warehouse is situated on 3.5 acres in Cranberry Township, and is in close proximity to the PA Turnpike and Interstate 79. The warehouse has 20’ clear ceiling height and two (2) internal docks with levelers. Additionally, it is equipped with two (2) three (3) ton cranes and a locker room. Included in the square footage is 3,200 SF office space.